Designed for a 250W light output, this set is excellent for cultivating larger ornamental plants (e.g. lilies), and is also well-suited for bringing cultivated plants (such as tomatoes) to a substantial yield. The Economy edition of this set comprises the optimally-priced variants of our complete hardware solution. The Homebox Q100 Ambient is a grow tent from Eastside Impex and is considered to be a classic among grow tents. With measurements of 100x100x200 cm, the Homebox offers a lot of space. The reflective interior walls of the ?PAR+? edition also play a part in making optimal use of the light energy implemented. 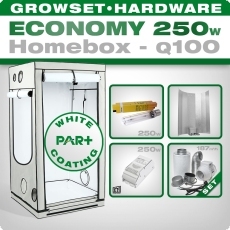 Like all of our HPS sets, the 250W Homebox Q100 Economy grow kit also comes with a magnetic ballast from GIB Lighting. The set also includes a quality HPS lamp as well as a reflector and frame. As such, the Homebox Q100 250W Economy grow kit offers diverse implementation possibilities, ranging from ornamental plants to home harvests. 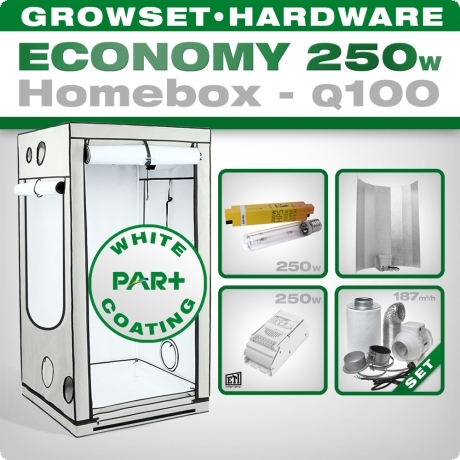 The Homebox Q100 250W Economy grow kit guarantees sufficient air supply thanks to our reliable 160 Eco ventilation set; in keeping with the versatility of this set, this small fan can be operated at two levels (15W/25W) and extracts up to 187 m3 of used air out of the grow tent per hour. With a compatible carbon filter, fast clamp, as well as 3 metres of flexible ducting and all accessories (for optional wall mounting), a ventilation system can be installed with minimal effort. Our hardware set is rounded out with quality accessories for time control of lighting and fans, as well as practical Easy Rollers for height-adjustable suspension of the reflector. Note: Cabling work is required. It should only be connected by an authorised specialist. The legal requirements (VDE guidelines) must always be met. CRP FOOD Import Export GmbH accepts no liability and provides no warranty coverage for damages to objects and persons caused by improper connection.